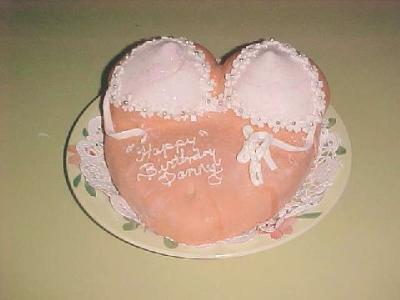 To make this bra cake, I used a heart shaped pan first and baked on layer of chocolate cake. I used the rest of the batter and made two pyrex custard cups for the bust. I buttercreamed the heart cake and set the others on top. I made fondant frosting with the MMF recipe and colored it. I put it over all of the cake and molded it to the shape. Then, I made a bra out of white fondant and the flowers and strings. It was for out male manager's birthday. Awesome cake. It looks really real. Your fondant work is good. I can't wait to learn the fondant technique. I've seen most of these cakes by Nancy up close and personal and all I can say is that they are more beautiful than the computer can show! Congratulations, Nancy. Love, me. I love your cakes and envy your talent with the fondant...and everything else! I got an order for a LARGE fire truck for this weekend. It will be an experiment, as all of mine are.